There was a lot happening in that particular over from Bumrah. An Australian batsman dumbstruck by the skills of an Indian fast bowler is an exciting scene to witness and the Perth Stadium, which is hosting its first-ever Test match at the moment, saw such a moment materialising. 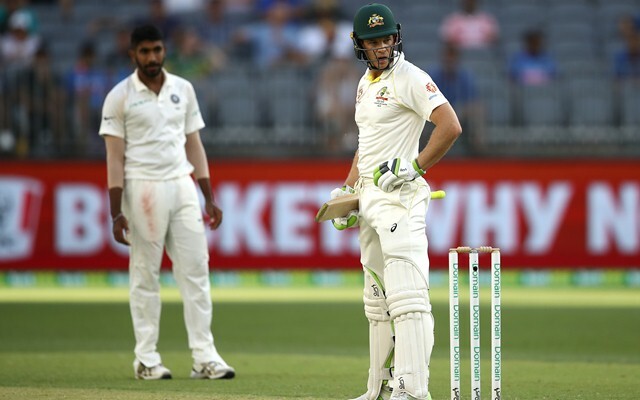 The Indian pacer is Jasprit Bumrah whose magical spell towards the end of the day left Aussie captain Tim Paine baffled, to say the least. Although the wicketkeeper-batsman is still holding his fort as the hosts ended the inaugural day at 277 for 6 after winning the toss and electing to bat. Bumrah was the pick of the Indian pace battery in terms of the economy rate. He bowled 22 overs in the day, the maximum of the lot, and conceded just 41 runs and picked one wicket. He disturbed the hosts’ batsman throughout the day with one that took off surprisingly. However, it was two his consecutive balls in the 84th over of the day against Paine which got a lot of applause and even left the batsman wondering for an explanation. The fourth delivery of the 84th over straightened off the seam and zoomed past Paine’s bat while the next one shot up from a good length and completely fooled the batsman who was trying to play it on the leg side. The unplayable ball then beat wicketkeeper Rishabh Pant as well, flew over his head to end up in four byes. Bumrah kept on looking in disbelief as to how the ball missed kissing the bat while Paine kept on staring at the wicket with once glance at the bowler in between. 'Don Bradman's not hitting that one'. India picked four seamers for the second Test of the series which they are leading 1-0 after their 31-run win in Adelaide earlier this week. While Ishant Sharma took two wickets, Bumrah and Umesh Yadav picked one each and spinner Hanuma Vihari, who is playing in the place of an injured Rohit Sharma, took the two others. Three batsmen scored half centuries for Australia including newcomer Marcus Harris (70), Travis Head (58) and Aaron Finch (50).